The Supreme Court today reopened the case of Hindi film “Kabhi Khushi, Kabhi Gum” director Karan Johar on the use of the National Anthem in the movie to consider the question whether its recitation could be allowed in a commercial cinema. The Supreme Court yesterday reserved its judgement on the petition of Kanchi Shankaracharya Jayendra Sarswathi seeking transfer of a murder case against him outside Tamil Nadu with the state government suggesting Pondicherry. Ms Uma Bharti, who had kept the BJP Central leadership on tenterhooks in the past one week, today agreed for a temporary truce and announced that she will not take up the issue of removal of Madhya Pradesh Chief Minister Babu Lal Gaur till the end of Bihar Assembly polls on November 18. The BJP today sought a judicial probe into the ethnic bloodshed in Assam’s Karbi Anglong district alleging Congress’ involvement in the tribal violence that has left scores dead in almost a month’s time. The National Human Rights Commission (NHRC) has directed the Jammu and Kashmir Government to appraise it of the status and outcome of a CBI investigation into the killing of five persons in Panchalthan-Patribal by the security forces in 2000. After a dismally low voter turnout on Tuesday, all political parties are leaving no stone unturned to ensure a higher participation of the electorate in the second phase of the Assembly elections on October 26 when the fate of 69 seats would be decided. After Congress, the CPI(M) has also decided to close ranks with the RJD in its battle against the Election Commission (EC). India today said it had not received any proposal from Pakistan on President Pervez Musharraf’s offer of free movement across the Line of Control in Jammu and Kashmir and any action could be initiated only when it received a formal proposal. The Mumbai police has not decided on any action against actor-politician Govinda who was shown hobnobbing with gangster Dawood Ibrahim by a television channel earlier this week. The Congress said today that a decision on change of guard in Jammu and Kashmir would be taken in the “near future”. The Centre has asked the security agencies including paramilitary forces and the Jammu and Kashmir police, to streamline the security mechanism in such a way that visitors to VVIPs in Jammu and Kashmir are effectively filtered. Japanese godwoman buries herself for world peace. Deciding a bunch of appeals by the Haryana Government against the Punjab and Haryana High Court judgment holding that employees once recruited irrespective of the selection process, were entitled to “equal pay for equal work” under Article 14 of the Constitution. The apex court further held that the employees engaged on contract for a specific job, could not claim regularisation, as their service would be strictly guided by the terms and conditions of the contract. The Haryana Government, which itself was responsible for giving back-door employment to hundreds of persons by engaging them on daily wages and contract in Class III and IV grades in various departments over the years, had moved the Supreme Court, challenging the High court order. Setting aside the impugned judgment, a Bench of Mr Justice S N Variava, Mr Justice A R Lakshmanan and Mr Justice S H Kapadia took exception to the High Court deciding all the cases in a “mechanical” manner. “The principle of equal pay for equal work has no mechanical application in every case,” the Bench ruled. “Where persons are selected by a selection committee on the basis of merit with due regard to seniority, a higher pay scale granted to such persons who are evaluated by the competent authority cannot be challenged,” it said. The Bench said for the application of the principle of equal pay for equal work, the courts had to consider various dimensions of a given job. “The accuracy required and the dexterity that the job may entail may differ from job to job. It cannot be judged by the mere volumes of work,” it observed. The court said reliability and responsibility towards the job of a persons coming through a legally laid down selection process would be more than those engaged on daily wages or contract. Since many of the daily wage employees were regularised while the case was pending in the High Court and the Supreme Court, such workers had claimed back wages with arrears, therefore, the apex court referred all cases back to the High Court with a direction that each and every matter should not be decided in a “mechanical” manner. Laying down guidelines to the High Court how to proceed with these cases, the apex court said it must satisfy itself that the work discharged and the condition of service of a daily wager was equal to that of regular employees, if at all a case was made out for grant of relief. Regarding contract employees, the Bench said that the High Court had to take into consideration the terms and condition of the contract. The apex court had on March 7 disposed of the petition holding that there was no need for audience to stand up during the recitation of the National Anthem if it was sung as part of the film’s script. The issue had reached the Supreme Court last year when Johar had challenged the Bombay High Court order on removing that portion of the movie, in which schoolchildren of a British school were seen singing the National Anthem without following the code for its recitation. The petition in the High Court was moved by Mr Shyam Narain Chouksey. Following the High Court order, Johar had filed an SLP in the Supreme Court. It was disposed of by the March 7 order. Not satisfied with the final order of the apex court, Mr Chouksey has moved a review petition on the ground that the issue was not fully decided as the question whether there could be commercial use of National Anthem in cinema had not been answered by the apex court, his counsel argued. Though Tamil Nadu Government counsel Rajiv Dhawan opposed the transfer, he said if the court came to the conclusion that the trial needed to be shifted then Pondicherry would be ideal. Shankaracharya’s counsel Fali S. Nariman told a Bench of Chief Justice R.C. Lahoti and Justice G.P. Mathur that “fair trial” would not be possible in the state under the present government, which was “bent upon to frame him up”. The firebrand leader made this announcement after meeting party incharge of Madhya Pradesh and BJP General Secretary Arun Jaitley here minutes before she left for Bihar for campaigning for the second phase of polls there. “I will not raise the issue till November 18 (the last phase of Bihar polls). I have raised issues within the party norms and the legislators have conveyed their message to the party leadership. I will not harm either the party or ideology. “I am not vibishan. I stay in Ayodhya and not in Lanka. I will not set my own house on fire. I would prefer to go in exile than harming my party,” she said. Earlier in the day on arrival in the capital, Ms Bharti said she was the “mother” of the party government in Madhya Pradesh which she would not let fall. “Otherwise, given the support of the party legislators, it could have fallen any time. In the last three days, people could have marched to the Governor’s House and the government could have fallen. But we will not let that happen at any cost,” she said. “The place where this bloodshed occurred is represented in Parliament by a Congress representative. Its MLA is a Congressman and the Karbi Anglong Autonomous Council is also headed by a Congress leader,” Mr S S Ahluwalia, in charge of the BJP affairs in Assam, told a news briefing after a visit to the stricken areas. “Suspicion mounts when Dimasas, who make up just three per cent of the area population and have no militant record, are blamed for the carnage,” Mr Ahluwalia said demanding a judicial probe by a sitting Supreme Court judge. The commission took cognisance of newspaper reports that quoted the villagers as saying that the five persons were civilians and not terrorists who had killed 35 Sikhs in Chhittisinghpora. The villagers’ account contradicted the version of the security forces that claimed that the victims were militants. The report received from the Chief Secretary, J&K Government, showed that on March 27, 2000, a complaint was made before the Chief Judicial Magistrate, Anantnag. It alleged that the five persons, missing from Barain Angan and Anantnag, had actually been killed at Panchalthan by the security forces but falsely shown as militants. Two days later, the Court of the Chief Judicial Magistrate, Anantnag, ordered an inquiry into the matter by the Deputy Superintendent of Police, Anantnag. During inquiry, the bodies of five persons killed at Panchalthan were exhumed and a team of doctors conducted the autopsy. The DNA samples of the bodies along with those claiming to be relatives of the deceased were taken by a team of doctors headed by the Head of the Department, Forensic Medicine, Government Medical College, Srinagar. The samples were sent to the Director, Central Forensic Science Laboratory and Director, Forensic Diagnostic Laboratory, Hyderabad, for analysis. The reports received from the two laboratories pointed to discrepancies in the samples. Fresh samples of the bodies and blood samples of persons claiming to be relatives the deceased were collected again by experts from Hyderabad and Kolkata and taken to the respective laboratories for DNA finger printing. Through a notification dated March 15, 2002, the J&K Government appointed Justice (retired) G.A. Kuchhai to ascertain whether the samples sent for DNA testing to the Kolkata laboratory were fake and other related matters. The G.A. Kuchhai Commission of Inquiry submitted its report to the J&K Government on December 15, 2002. After receiving the report of the one-man Commission of Inquiry, the state government constituted a Cabinet sub-committee to examine the report for further action. 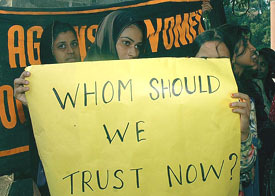 The NHRC received a communication on February 22, 2005 from the Under Secretary to J&K Government (Home Department). It stated that the state government had ordered suspension of the then Senior Superintendent of Police, Anantnag and removal of Assistant Sub-Inspector, the then In-charge of the Police Post. The state government further stated that the case had been referred to the CBI and was being investigated. Every leader is appealing to the electorate to exercise its right of vote and is asking party workers to bring out voters to polling booths next week. Low voter turnout on October 18 has unnerved political leadership here as no leader is ready to hazard a guess whether voter behaviour this week has helped or harmed their party. A seasoned poll observer, Mr Venkatesh Prasad Sharma, said polling in the first phase was one of the “most genuine” voting in the recent past of Bihar. The credit for this went to the stepped-up vigil of the Election Commission and its officials which had taken several steps for ensuring genuine voting, he said, adding that Mr K.J. Rao was doing a commendable job. To begin with, the commission not only deleted about 20 lakh bogus voters from the electoral rolls, but also ensured that a large number of history-sheeters with proved criminal record were not allowed to interfere in the electoral exercise, Chief Electoral Officer N.K. Sinha said. In a nutshell, prevention of booth capturing and bogus voting were two main reasons for the lower turnout but even in the best of times in the recent past, the polling had been around 55 per cent and there had been a drop of about 10 per cent in the first phase, another junior level poll official said on condition of anonymity and added that the polling had been more or less on the past pattern if one discounted bogus voting. A smaller reason was that migrant workers also did not participate in the first phase, a teacher, Ram Narayan Yadav, said, adding that voter fatigue or lack of enthusiasm for frequent elections were the other factors. The correctness of the migrant worker could possibly be judged when the voting percentage of the third phase was known because a large number of them would return to the state during Divali and Chhat festivals. The NDA may have benefited a little from it as the prevention of bogus voting was done largely by the RJD as it was in command of the state apparatus or machinery till the last February election. The state chief electoral officer’s revelation that 25,000 bogus voters were found and deleted in the Raghopur Assembly constituency which is represented by former Chief Minister Rabri Devi, is an indicator of the electoral reality in the state. The CPI (M) politburo member Sitaram Yechury today said that some recent actions of the EC involving the Bihar polls were raising doubts about its impartiality. Mr Yechury was talking to the media here today on issues pertaining to Bihar polls. While supporting any step by the Election Commission which could ensure free and fair polls, Mr Yechury claimed that such huge deployment of paramilitary forces was creating a fear-psychosis in the minds of the voters resulting in low turnout in the first phase of polls. Mr Yechury did not approve the way EC had transferred the IG (CRPF) and DIG (CRPF) for meeting Mr Lalu Prasad Yadav at the midnight of October 16. 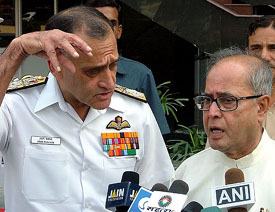 Speaking on the sidelines of the Naval Commanders’ conference here Defence Minister Pranab Mukherjee said: “We have not received any official proposal from Islamabad to this effect,” adding that only when an offer at an official level is received would “we initiate any action”. Later addressing the media on the deliberations that took place during the conference, the Chief of Army Staff, Gen J.J. Singh, said the Army had given its recommendations to the government and would initiate action only after a go-ahead from the Centre. On the recent agreement with France on the building of six Scorpene submarines under technology transfer, Mr Mukherjee said this would give a strategic boost to the country by reopening underwater vessel manufacturing capability within the country. He said for effective maritime defence India would require a credible naval force structured around aircraft carriers with a balanced mix of ships, submarines and aircraft to influence the battle on land. He said the induction of the state of the art submarines would provide the Navy sea-denial capability. Referring to the long gestation period that naval projects take, the minister said the government would ensure that the Navy was provided with a long-term funding support from the Defence Ministry for a sustained growth. Underlining the need for building international maritime cooperation in the present security scenario, Mr Mukherjee said: “I am aware that the Navy is actively involved in strengthening relations with major maritime nations in general and Indian Ocean Rim nations in particular through maritime diplomacy”. Police Commissioner A.N. Roy said a decision would be taken only if the government ordered a formal inquiry against him. “I have asked for the CD. After seeing it, if something is found then we will take necessary action,” he said. Replying to queries on implementing the understanding under which a Congress nominee is to take over reins of Jammu and Kashmir from the PDP in November, Congress spokesman Abhishek Singhvi said a decision would be taken in the near future by Congress President Sonia Gandhi. “The CRPF and the state police will try to evolve a foolproof mechanism whereby the flow of visitors to the Ministers and MLAs could be regulated in a systematic manner,” Union Home Secretary V.K. Duggal told newspersons here today. Terming the killing of state Education Minister Ghulam Nabi Lone as unfortunate, he said the militants were heartless as when the entire government machinery was busy providing relief and rescue, they struck at Tulsi Bagh. He denied that there was any security lapse that led to this high-profile killing. Meanwhile, about the quake relief operations, Mr Duggal maintained that there was no threat of epidemic outbreak in the quake-affected areas in the state.